If the State of Texas ever left the Union, Chuck Norris is interested in being president of the newly independent country. (CNN) – Actor Chuck Norris has his eyes on the presidency, but not the White House. Norris wrote that he would be interested in becoming the president of Texas, if the state were ever to secede from the Union. “Anyone who has been around Texas for any length of time knows exactly what we'd do if the going got rough in America,” Norris wrote. “Let there be no doubt about that.” Norris was a strong supporter of Mike Huckabee’s presidential bid, and he helped to draw attention to the former Arkansas governor’s campaign. 1836 all over again! I like it. The Republic of Texas rises again! Over a hundred years later, we still consider ourselves Texan first and American second. 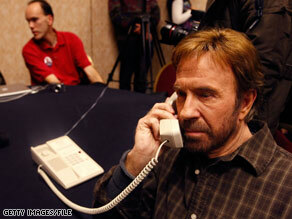 Chuck is just an actor, so calm down. Texas can't leave the union and I don't want it too. But Texas is a strong state and can whip the !!@! @ out of any of you other state'sanytime, anywhere! We are always ready. Texas rules!!! That was 14 years before the South seceded. and let's not forget how America seceded from the tyranny of Great Britain. It's not cutting and running it's standing up to the tyranny of a government who burned the Constitution years ago! Forget about seceding, think of the benefits if, instead, we sell Texas to Mexico! The sales proceeds could be used to fully fund Social Security and Medicare, or pay down the debt, or fund the infrastructure rebuildling needed across the country. In addition, the price of foreign-produced gasoline is much cheaper than domestically produced gasoline, so our energy costs will decline. Unfortunately, we would lose Chuck Norris and former Presidents Bush and Bush. We would also lose Tex-Mex food...it would become Mex-Mex food. Hmmm. Let's think about it. We would keep working and holding true to the values that have made Texas a great state – courage, hard work, and letting others be.